Nic and Nigel Martini are enjoying the Manhattan night life at the opening night party for a Broadway play. The play was written by their good friend, Harper, and they are enjoying her accomplishments as much as they enjoy the people watching at the party. Harper’s husband, Dan, is a theatre critic and not a particularly nice man. He writes a negative review of his wife’s play and is found murdered the next day. Aside from being a negative reviewer, Nigel and Nic didn’t think much of him as a human being and that Harper is probably better off without him. But when Harper is the prime suspect in Dan’s murder, Nic and Nigel go in to action to track down the real killer. I haven’t read any of the other books in the Nic and Nigel series, but with my new-found appreciation for mysteries and the fact that I 1) love Manhattans as my drink of choice, and 2) I’ve spent a career working in theatre so the people and situations here are all familiar to me, I decided to give this a read. One of the great things here is that even though this is the third book in the series, I never felt as though I was missing a large chunk of the story or character history. I suspect that there is some character growth through the series, but nothing was necessary to enjoying the current book. I greatly appreciate this sort of series! The connection between Nic and Nigel is really well done. I am reminded of great partnership detective series like Hart to Hart or Partners in Crime or Nick and Nora. There’s elegance and class and the couple understands each other rather intuitively. It’s the sort of companionship that puts a smile on the reader’s face just sensing the connection. Author Tracy Kiely also does a nice job of letting us get to know the victim. We see what an absolute heel he is, which prevents us from sympathizing over his death, but also lends itself to our suspecting Harper early on. Given the ‘cozy’ nature of the book, I did feel it went on a little too long – that we spent just a tad more time than necessary gathering clues and getting suspect backgrounds. Although the chapters are extremely short, making this an easy read, there were times I just wanted to get on with it and I wondered what the point was in a few of the chapters. Even so, this is one of the better cozy mysteries I’ve read and I look forward to reading the earlier books, and subsequent new books in the series. Looking for a good book? 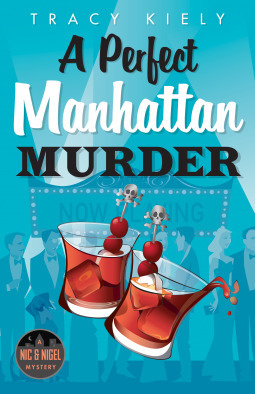 A Perfect Manhattan Murder by Tracy Kiely is a classy cozy mystery that will satisfy the quench for a smooth read.